In 1983, the year before the coal miners' strike - one of the most bitter industrial disputes in British history - the UK produced 119 million tonnes of coal. Production would never reach that level again, with the strike heralding the long slow decline of an industry they once called King Coal. Thirty years later, China's growth in coal consumption - just its growth - was not far off the UK's 1983 total output. In 2013, China consumed an extra 93 million tonnes of the stuff. That amount - a mountain of the black fuel that would at one time have kept the best part of a quarter of a million British miners in work - represented only a 2.6% increase in China's seemingly insatiable appetite for coal. Like Britain, China's industrial revolution has been coal-powered, but it has been on a scale and speed like nothing else in world history, bringing with it serious environmental implications. China surpassed the United States to become the biggest emitter of greenhouse gases in 2007 and, if that trajectory is followed, it is well on track to double US emission levels within the next few years. For anyone, anywhere worried about climate change, China has become the problem, and with the country opening a new coal-fired power station on average every week, it is a problem that has looked likely to simply grow and grow. Except that the recently released figures for 2014 suggest that something very interesting may now be happening. Rather than another giant increase in coal consumption, for the first time in 15 years, government data shows that China's annual coal consumption declined by 2.9%, with an accompanying 1% fall in carbon dioxide emissions. Rather than never-ending growth, all the talk now is of "peak coal", the moment when China begins to wean itself off fossil fuels. And some analysts believe, on the basis of that 2014 figure, the moment may well have already arrived. "It's quite possible," says Wang Tao, an expert on climate and energy policy at the Carnegie-Tsinghua Centre for Global Policy in Beijing. "I wouldn't say 100% sure, but given what we're seeing in the heavy industries and the direction that China is trying to drive its economy, I don't think we're going to see a dramatic change and coal consumption back up again." Other analysts are a little more cautious, but almost all agree that peak coal, if it hasn't yet arrived, is closer than anyone previously thought. And while some of it may be down to simple economic factors - the now well-documented slowdown in Chinese growth in recent years - there is wide recognition that a significant shift in Chinese environmental policy is also playing a part. China used to argue that it was unfair for developed countries to lecture as, just as they had in the course of their industrialisation, it had the "right to pollute". If it had to choose between its economy or its environment, the old orthodoxy used to go, the economy would win every time. "There are priorities driving Chinese policy makers to move faster than they are used to," says Li Yan, head of climate and energy campaign for Greenpeace East Asia. "I think that the environmental crisis we're facing right now, especially the air pollution - no-one expected this to be a top political priority four years ago but look at where we are now," she says. "The issue is shaping energy policy, economic policy and even local agendas in the most polluted regions." Here, she says, the public simply "cannot bear the air quality the way it is any longer". China is now the world's biggest investor in renewable energy, particularly in power generation. In fact, the country has seen more than $400bn (£267bn) invested in clean energy in the past 10 years, and is ranked number one in the world in consultancy EY's renewable energy country attractiveness index. According to Wang Tao, one in every four units of power generated now comes from wind, solar or hydro plants, and a new debate has begun, focusing not on the need to build more renewable energy plants, but on how to best utilise this new and still rapidly growing resource. "We have to make sure that people have the incentives to continue to invest in these renewables, and also that consumers will be able to know and to choose wisely in terms of what kind of electricity they consume, and also change their behaviour," he says. And where once everyone spoke about the huge vested interests in China's fossil fuel-powered sectors, many believe the government is starting to take them on. "In Hubei Province," Li Yan says, "we are observing very bold and firm action to close down the dirtiest fleet of the iron, steel and cement sector, even at the cost of temporary job losses. "I think that's a painful process, but it's also a demonstration of how important the air pollution agenda is in this region." Greenpeace's great fear had once been that China was preparing for a huge shift towards coal gasification projects - rather than using coal directly to fuel power plants, using it to produce natural gas. While the end product may be cleaner, critics argue that the industrial processes involved in the conversion emit more greenhouse gases and have other serious environmental impacts, like the huge amount of water consumed. But even here, there appear to be signs of a bit of a rethink going on. China's state-run media has cited an unnamed policymaker as saying that while the country will complete the construction of already approved coal-to-natural-gas plants, it will not approve new ones, at least until 2020. It is of course much too early to suggest that China is turning its back on King Coal. The fuel will make up the majority of its energy sector well into the next decade, a period over which it will continue to burn well over 3 billion tonnes of it every year. But even as new power plants come on stream, it seems likely that - if it hasn't already happened - very soon the overall reliance on coal will begin to decrease and more and more of those new plants will be forced to operate below capacity. If the slowdown in economic growth becomes more serious and sustained, then some environmentalists believe we could yet see the Chinese government lurch for another bout of stimulus spending, pouring money into the big energy-intensive industries and sparking another coal boom. 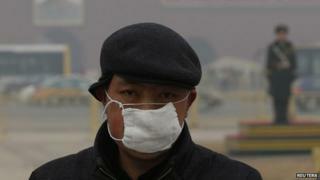 But for now, there are signs that China's unbearable air has become the catalyst for at least the beginnings of a fundamental change in direction.